Jindabyne and the Alpine region has some of the most amazing mountainbiking terrain I’ve seen,” said IMBA USA’s Joey Kline on his last trip to Australia. Like so many ski towns around the world, Jindabyne is seeing an ‘off-season’ mountainbiking boom. 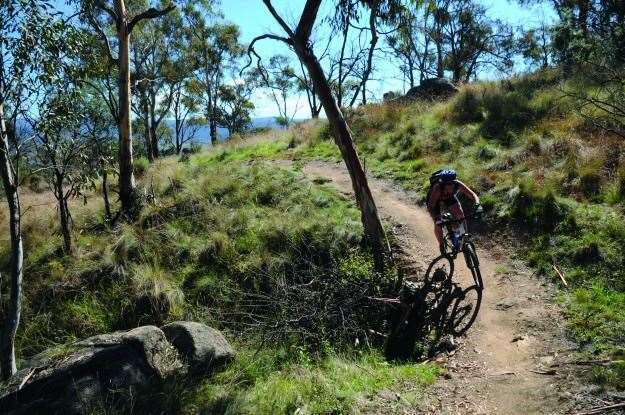 As the Lake Jindabyne Trail gets the go-ahead, and Thredbo, Lake Crackenback and Bungarra all invest in Jindabyne's mountainbike trails - and the town's future - local government and businesses are finally jumping on the singletrack bandwagon. Jindabyne has enough exciting new and old trails for mountainbikers of all levels to enjoy, and there's way more to come. The terrain will blow your mind. New mountainbike trails are springing up aroudn Jindabyne and its surrounding area, with another four new mountainbiking areas created or grown from old trails thanks to the work of local government and riders. 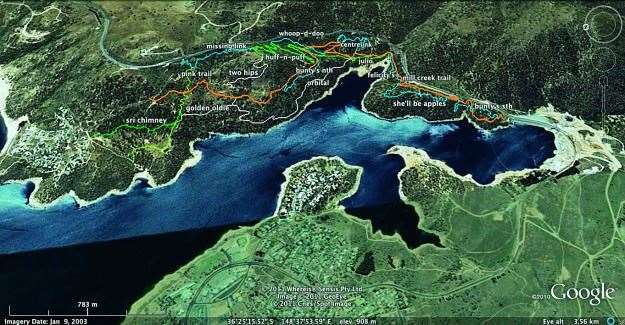 New trails are being built from the Jindabyne dam wall as part of the Lake Jindabyne Trail. The TVT trail, from Thredbo to the Skitube, is progressing; Crackenback Resort trails are growing; and a whole new network of trails called Bungarra are taking shape for the newly formed Jindabyne Mountain Bike Club. Plus the Thredbo Downhill has got a long awaited A-line. All within half an hour drive of the town and each other, these tracks include black, blue and green trails, flow tracks, pump tracks, obstacle courses, and some unbelievably sweet, undulating singletrack. 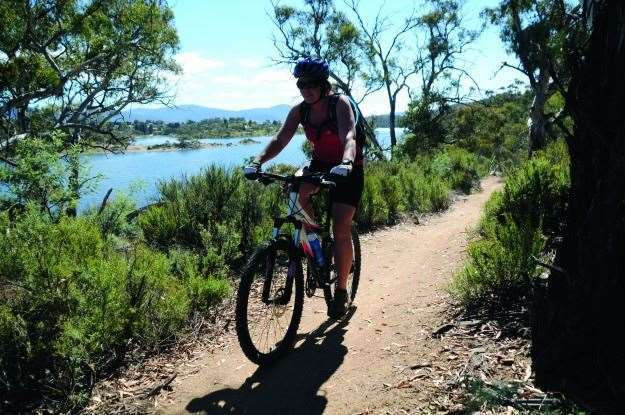 The Tyrolean trail network has just had a massive upgrade as part of the development for the Lake Jindabyne Trail, a 70–100km trail circling the lake. The new section of trail with the catchy name ‘The Mill Creek Trail Section 1B’ has been designed to IMBA standards and is a multi-use shared trail, with massive berms, switchbacks and lots of undulations that become doubles and triples depending on your riding ability. This new trail is heaps of fun and provides easy access to the more technical trails within the Tyrolean Mountain Bike Trail network. 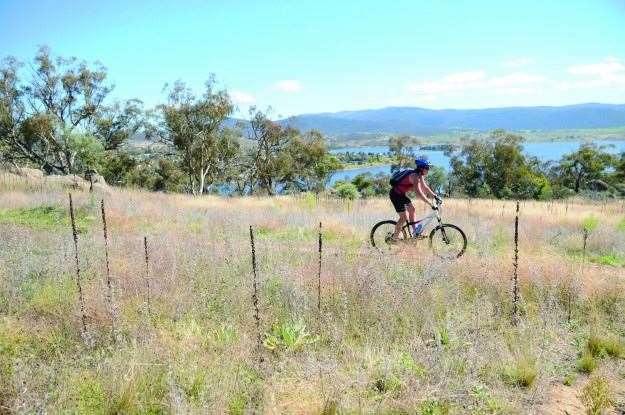 Novice riders and XC riders will enjoy the new Mill Creek Trail, with its smooth flowing trail, easy climbing (not steeper than 10 degrees) and majestic views overlooking Lake Jindabyne and the Snowy Mountains. Existing Tyrolean Trails include green, blue and black downhill runs. If you feel challenged on Tyrolean’s downhills, you’d better buckle up for the climb out, because Tyrolean has equally challenging climbs. Advanced/black runs at Tyrolean include two North Shore-style technical freeride runs. Other trails offer a variety of terrain in a single run, and you could find yourself ploughing through rock gardens, jumps, berms, switchbacks or fast downhills sections all on the same descent. Riders of all levels will love Tyrolean for its accessibility and challenging climbs and technical riding. You’ll need two to three hours to ride them all. Lake Crackenback Resort on the Alpine Way has over 10km of cross- country singletrack around the resort. From the golf course, the first section heads down along the Thredbo River, negotiating a few tricky little turns, rock gardens and dips. From there a beautiful singletrack follows the river – if you fish, take a rod – and then turns 180 degrees and heads back up to Lake Crackenback Resort along a less technical trail for a few kilometres. of steam before calling it day. Riding at Lake Crackenback Resort is free – just register at the office. The resort has a bike hire shop and a small cafe next to the main office. At Thredbo, the TVT Trail (from Thredbo Valley to Bullock Flat) will follow the Thredbo River, linking up with Crackenback resort trail. There will be about seven river crossings as the trail winds down Thredbo Valley. A new trail network at Bungarra is almost complete. Bungarra is a privately owned property three kilometres out of Jindabyne. This new 15km trail network is on private property and is open for riders with MTBA insurance on Saturday afternoons and Wednesday evenings, or contact the Jindabyne MTB Club for club rides. The locals will be staging enduro, single-speed and school events here this summer. The Bungarra Trail Network includes a huge pump track – the love of my life – a skills course, flow trails and a jumps zone. Finding the best trails is easier and more fun with a local or a guide. The Sacred Ride – sacredride.com.au – hires out bikes and runs Jindabyne Adventure Bookings for mountainbike guides and other adrenaline- driven activities.